A grand total of 1 billion people use Gmail. I wonder though of all those people using Gmail do they know they have access to all the benefits of Google Apps? Do you? You will after reading this blog. First we will talk about where to find the Google Apps and then we will highlight a few of our personal favorites. While logged into your Gmail email you will see 9 squares in the upper right corner of the screen. When you click on these 9 little squares you will see all of the basic Google Apps (we will talk about those in a moment). 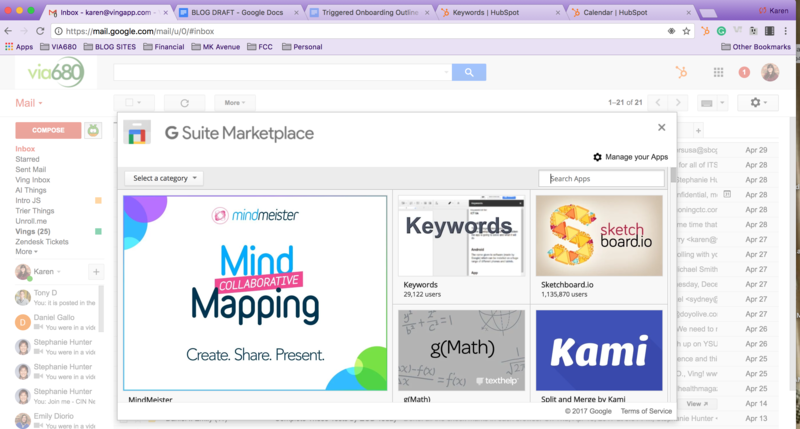 If you click more and continue to scroll to the bottom you will be able to navigate to the Google Apps Marketplace. Once you click More from Apps Marketplace you will see the model pop up. Enough about where to find them now let’s dive into the basic Google Apps, these are the ones that you will see when you first click the 9 squares in the upper right corner. 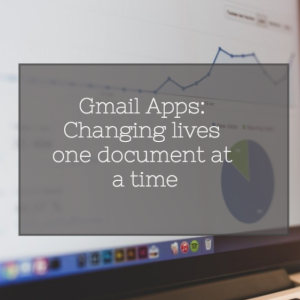 The basic Google Apps includes Docs, Sheets, Slides, Drive, Contacts and Calendar. Docs, Sheets, and Slides replace the Microsoft versions of Word, Excel, and Powerpoint. These Google Apps make it easy to collaborate with employees in real time — talk about improved productivity! SignEasy allows your employees to easily sign Google Docs (new policies, training, etc). Calendly allows people to schedule a meeting on your calendar without all the back and forth about what time works for both parties. Ever want a virtual whiteboard? This Google App makes it happen! And of course, Ving! Now you can share multiple files in one location in an attractive trackable way — goodbye ugly file attachments. There are so many Google Apps out there these are just the beginning. We want to know what Google Apps you use or what you think of the ones that our office uses.